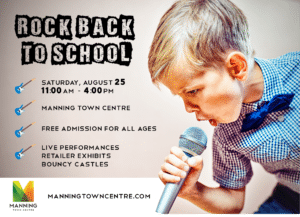 Manning Town Centre>News and Events>General>Rock Back To School! Ladies and gentlemen, it’s time to bring out your inner rock star! Young and old, we’re rocking the last of the summer days before it’s time to go back to school. Bring the kids for some free family fun on Saturday, August 25 from 11:00am to 4:00pm at Manning Town Centre (in front of Cineplex). We will have live musical performances, retailer exhibits, and bouncy castles! Don’t miss out on this summer’s biggest event at Manning Town Centre!